[SMALL MAKEUP and MEDICINE ORGANIZER]-You can store many kinds of small jewelry,cosmetics,makeups,medicine,personal beauty care products and make your bathroom clean cut.A quick makeover of all your vanity/ bath/ beauty anything organizing needs.Such as nail polish,lipsticks,lip gloss,cotton balls swabs rounds pad powder stick,a q-tips,toiletries and other miscellaneous items. [PERFECT U-SLOT DESIGN]-The little U shaped hole allows you to grab a cotton square instead of having to remove the lid everything single time. 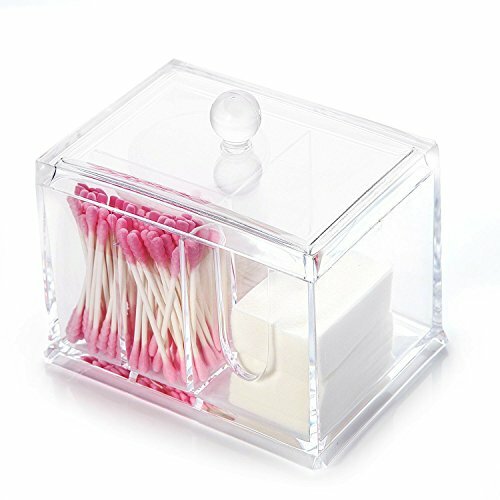 [SLEEK STYLE]-Super chic and cute vanity storage box.Well-made,sturdy and thicker acrylic box,not that cheap flimsy stuff! [SAVE SPACE]-A small vanity organizer in the guest bathroom takes up less room.It\'s also a exquisite gift for your friends or relatives.